I know quite a few blogshops have sold this but i'm always too slow. 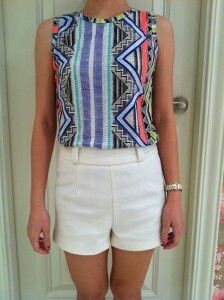 I've finally found this from shoppesophia and decided to wear this as a top instead. Loving the colours and its really comfy as the material is quite light. 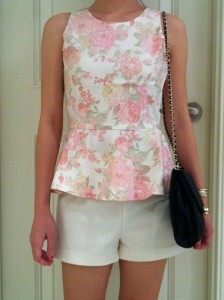 I've also gotten this floral peplum top and its colours is really pretty in real life, more towards a pastel shade. The images on their website did not capture the colours well i feel. The material is good though as its quite structured. It comes in pastel mint too and i'm thinking if i should get it in that colour as well. Must agree with Mel that the photos on this new blogshop are flat. You can actually see shadows behind the model. If the photos were taken in a studio... think ShoppeSophia should get a new studio.